“what all the fuss is about” with regard to the growing resistance to Common Core State Standards. Most US states were “incentivized” to commit to these common education standards by competing for possible Race to the Top stimulus money. Idaho got the standards and more, but not the money. “The Problems With Common Core” directly from national education experts, who have been actively engaged with this initiative since its inception. Find out why a growing number of parents, grandparents, and educators are so very concerned about this latest version of national standards, national tests, and student data sharing. “hear the other side of the story” in order to draw our own conclusions. Please join us for this important opportunity to learn about the concerns that are sweeping our nation. is an attorney and a senior fellow with the American Principles Project in Washington, DC. In that position she has crafted federal and state legislation designed to restore the constitutional autonomy of states and parents in education policy, and to protect the rights of religious freedom and conscience. With Emmett McGroarty she co-authored the APP/Pioneer Institute report, Controlling Education From the Top: Why Common Core Is Bad for America. She has written numerous articles about the problems with Common Core and has testified about the issue before the legislatures of six states. She is a graduate of Clemson University and the Harvard Law School. is a visiting scholar at the Hoover Institution. From 2007 to 2009, Wurman served as a Senior Adviser at the Office of Planning, Evaluation and Policy Development in the U.S. Department of Education. Throughout the development of the Common Core standards in 2009-2010 he analyzed its mathematics draft standards for the Pioneer Institute and for the State of California. In the summer of 2010 he served on the California Academic Content Standards Commission that reviewed the adoption of Common Core for California. Wurman has published numerous professional and opinion articles about education and about the Common Core. is a former professor of education reform at the University of Arkansas and the 21st Century Chair in Teacher Quality. She served as Senior Associate Commissioner at the Massachusetts Department of Elementary and Secondary Education from 1999-2003, where she was in charge of developing or revising all the state’s K-12 standards, teacher licensure tests, and teacher and administrator licensure regulations. She served on the Massachusetts Board of Elementary and Secondary Education from 2006-2010. She served on the National Mathematics Advisory Panel, from 2006-2008. Most recently she served on the Common Core Validation Committee, from 2009-2010. 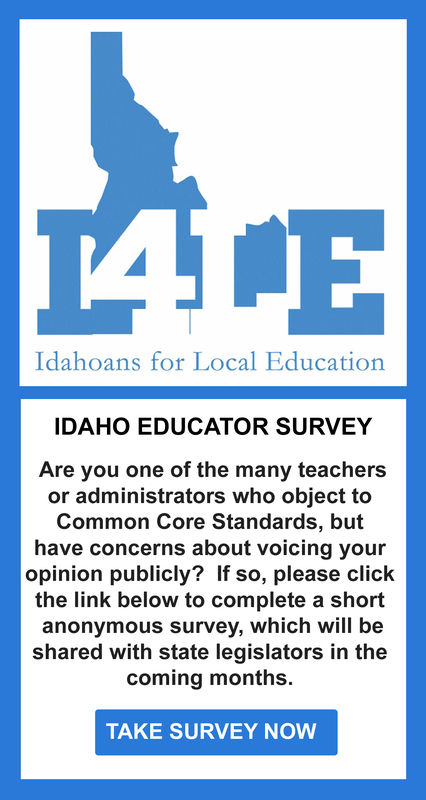 Fox News contributor, award winning author, and social media pundit… the one and only Michelle Malkin has agreed to send a special video message to Idahoans who share the concerns of her and her husband about Common Core and the gigantic federal footprint that accompanies it. Don’t miss her inspiring message to Idaho!